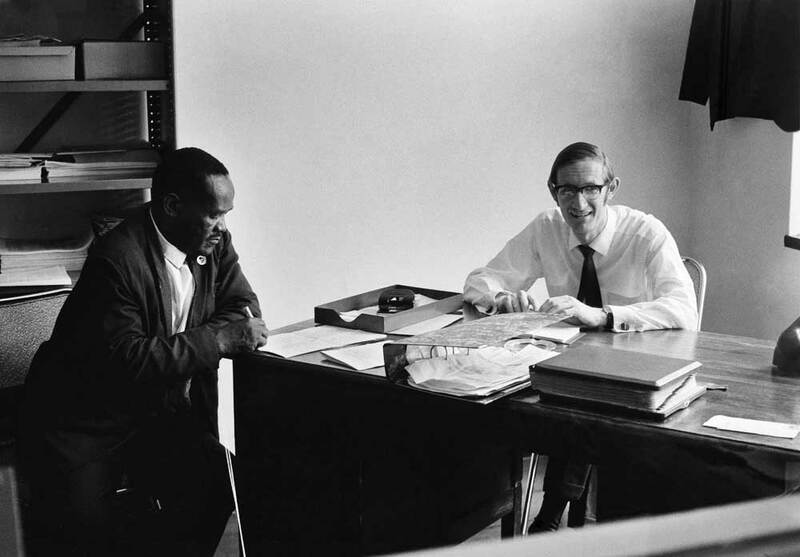 The Revd Brian Brown at the offices of the Christian Institute of Southern Africa in Braamfontein, Johannesburg , with President Mdletshe, an office-bearer of AICA. Brian Brown was employed by the CI to assist AICA. (See Bishop s & Prophets, chapter 8.) He was later banned under the Suppression of Communism Act, along with Beyers Naude and other members of the CI. West, Martin, “CISA Reverend Brian Brown with AICA office-bearer, President Mdletshe,” Martin West, accessed April 20, 2019, http://www.martinwest.uct.ac.za/items/show/10580.